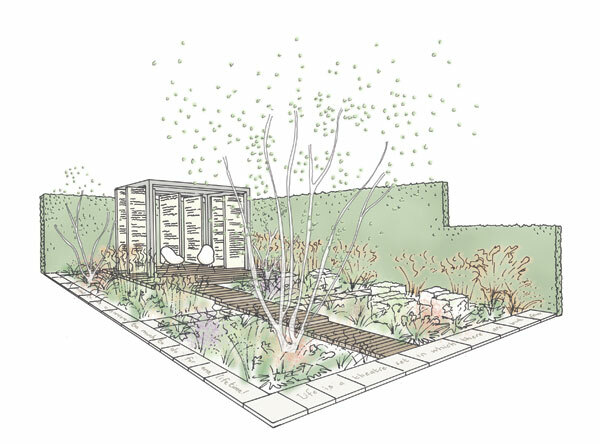 Carolyn Willitts was approached by the RHS to design a show garden for them for the BBC Gardeners’ World Live Show in Birmingham. The garden draws from Carolyn’s two careers, theatre design and landscape architecture, and weaves them together as independent but complementary influences. The calm, contemporary space promotes contemplation, and is designed to inspire positive life-changes. The garden is imbued with references to theatre; the summerhouse with its raised hardwood platform makes for a focal stage, and stone seating cubes become seats for an audience. Warm granite paving offers alternative routes and inspiring quotations. A tree grows through a trapdoor in the stage as nature creeps around and through the structures. Scenes from plays referencing gardens are layered onto transparent perspex panels in the summerhouse, which can be rotated on a whim to bring in new ideas. The simplicity of the design provides a still, quiet setting for the ornamental grasses, which are planted in airy drifts, offering movement and rich texture. Dreamy perennials hover within the sea of grasses in a palette of greens, clarets, violet and white.